Town in Moravia, Austria. About the earliest history of its Jews nothing is known. Pesina, whose "Mars Moravicus" was published in 1677, calls it "nidus Judæorum." 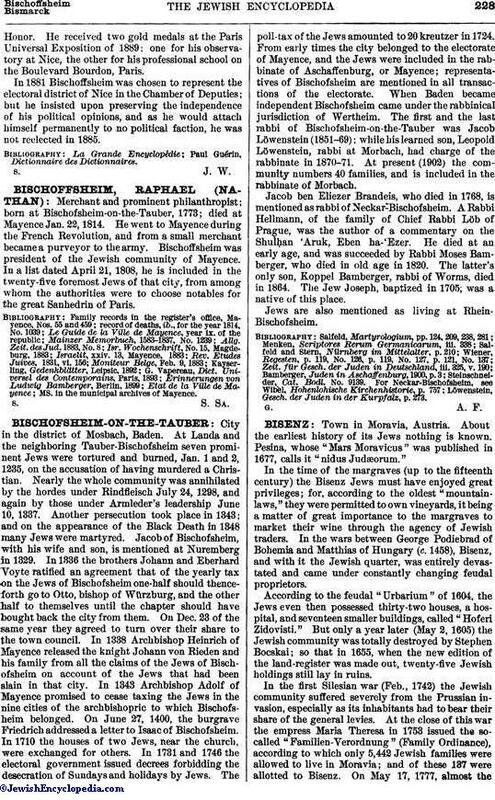 In the time of the margraves (up to the fifteenth century) the Bisenz Jews must have enjoyed great privileges; for, according to the oldest "mountain-laws," they were permitted to own vineyards, it being a matter of great importance to the margraves to market their wine through the agency of Jewish traders. In the wars between George Podiebrad of Bohemia and Matthias of Hungary (c. 1458), Bisenz, and with it the Jewish quarter, was entirely devastated and came under constantly changing feudal proprietors. According to the feudal "Urbarium" of 1604, the Jews even then possessed thirty-two houses, a hospital, and seventeen smaller buildings, called "Hoferi Zidovisti." But only a year later (May 2, 1605) the Jewish community was totally destroyed by Stephen Bocskai; so that in 1655, when the new edition of the land-register was made out, twenty-five Jewish holdings still lay in ruins. In the first Silesian war (Feb., 1742) the Jewish community suffered severely from the Prussian invasion, especially as its inhabitants had to bear their share of the general levies. At the close of this war the empress Maria Theresa in 1753 issued the so-called "Familien-Verordnung" (Family Ordinance), according to which only 5,442 Jewish families were allowed to live in Moravia; and of these 137 were allotted to Bisenz. On May 17, 1777, almost theentire Jewish ghetto, in which there were ninety-three houses, was burned. Up to 1782 the Jewish community was subject to the feudal lord; but in criminal matters they were under the jurisdiction of the city authorities. 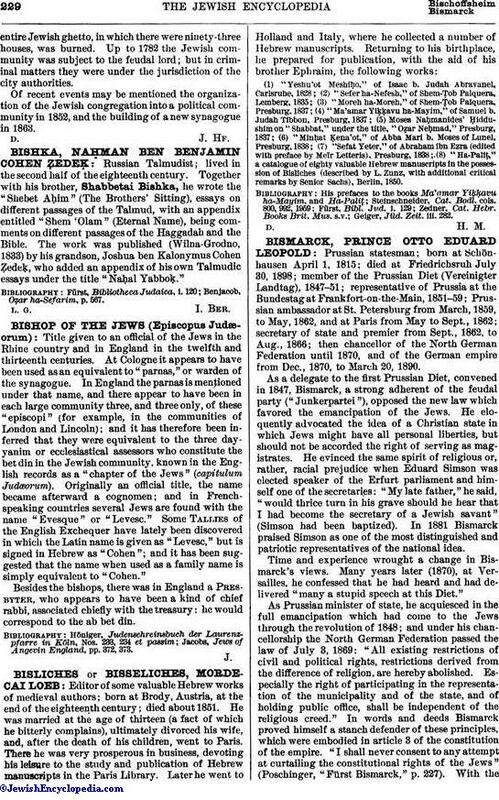 Of recent events may be mentioned the organization of the Jewish congregation into a political community in 1852, and the building of a new synagogue in 1863.